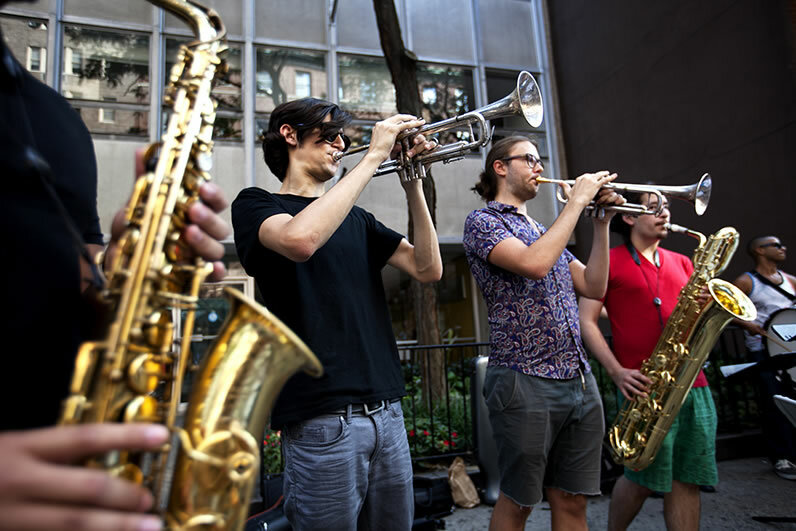 School of Jazz students performed live music at last year's block party. What does social justice mean to you? New School students had plenty to say at last year’s block party, jotting down their answers on an enormous sheet of paper at the table for The Antithesis, a student-run online publication started by Petra Jarrar, BA Politics ’17. To be held Thursday, September 1, 4:30-7:30 p.m., on 12th Street between Fifth and Sixth Avenues, the New School Block Party features free food and activities including art-making workshops, performances from the School of Jazz, presentations from a wide variety of student organizations in which students can get involved, and a tie-dying station for shirts that can then be picked up at The New Store. Students will have the chance to interact with members of on-campus groups such as the Anime Club, New School Debate Team, Wearable Tech, and Zine Collective and also learn about offices on campus such as the Tishman Environment and Design Center, the Lang Office of Civil Engagement, and Student Employees, among many others. Local businesses will also be on hand, ranging from restaurants including Grey Dog and Nanoosh to off-campus resources for students such as the New York Public Library, Blick Art Materials, and Zipcar. If you can’t make it out to the block party, you can always contact the office for Student Development, which can connect you with any of the university’s clubs or organizations.